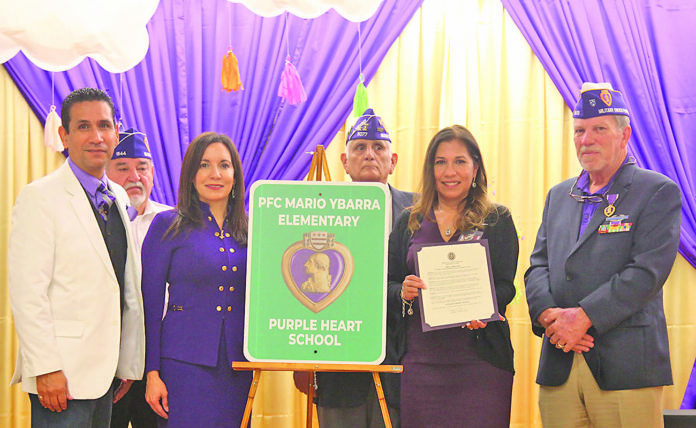 WESLACO — A school here has received the Purple Heart School distinction recognizing the campus’ dedication to veterans and their families. The Military Order of the Purple Heart bestowed on Pfc. Mario Ybarra Elementary School was celebrated during a ceremony in the campus cafeteria Wednesday morning. The room filled with students, school administrators and veterans listened to Mario Ybarra Jr. tell his father’s story. 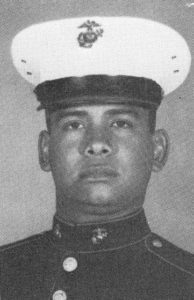 He spoke as the son of a U.S. Marine who was killed in action during the Vietnam War. The school has carried the name of his father, a Weslaco High School graduate, since 2010. He would be proud to be associated with learning and understanding, Ybarra said. He’d like to take that support a step further. Ybarra is advocating for SB 1557, a bill that would designate certain schools as “Purple Star Schools” for providing support for “military-connected students.” Students who are dependents of veterans or active duty members of the armed forces fall under this definition, according to the bill. A school would qualify for the status if it applies and has a staff member who would act as a liaison to represent these students. Providing resources such as counseling and partnering with local military organizations are among initiatives the representative would partake in. The program also presents awareness initiatives to connect military families and their communities such as toy drives. Constantly moving homes, anxiety of losing a family member and having trouble adapting are among the issues these students face, Ybarra said. Ybarra added that although the ceremony was dedicated to the military and veterans, it is important to recognize that teachers help sustain the growth of children. “They have the distinct opportunity to mold lives, and to propel them to greatness,” Ybarra said. The Purple Heart is a military decoration that honors veterans and military personnel who have been killed or wounded in combat. The Military Order of the Purple Heart is composed of veterans who have received the decoration. The order’s state commander, Jon Lunkwicz, said there is a need for honoring combat veterans and their families. As a former Army infantryman, he understands the commitment and need to support their dependents, he said. U.S. Rep. Vicente Gonzalez, D-McAllen, issued a statement praising the Weslaco school’s initiative to support the children of active duty military parents. “We are here today to make sure these kids know they are not alone and that we are here for them, and that they are not forgotten.” Gonzalez said.